How to merge multiple datasets in R based on row names? Here is a common everyday challenge. How does one combine several datasets using rownames as the key? This is known as recursive or repeated merging in R and a full outer join in SQL speak. First option is to manually merge the dataset by hand as follows. This advantage of this method is that it is clear and easy to double check. The disadvantage is the length codes and intermediate objects which becomes difficult to track with increasing number of datasets. I seen the use of Reduce() function in some forum threads that might help automate this. join_all( mylist, type="full" )  # not what I want! A few extra lines of coding to make the column names unique and adding the rownames as a column seems to solve this problem. However, I have not tested this widely. As a bonus, my codes is also ignorant of the column names which can be handy if every column is unique across the datasets. The column orders are preserved. Here are some codes to download the data from the 1000 Genomes Phase 3 website into your own server and calculating the allele frequencies for the European populations. Here are some setup codes. The panel file tells you which population and super-population each sample belongs to. Next we will download each chromosome (I am ignoring the Y and MT chromosomes here). Alternatively, you can download all the files on the FTP site using wget -r $FTP_SITE but I preferred to download each one separately. Note the Chromosome X is based on version 1b and not 5a like the autosomes, so has to be downloaded separately. I am renaming it for convenience later. The next step is to identify the Europeans and calculate the allele frequencies. I am also ignoring any variants that have a call rate < 95% and fails Hardy-Weinberg Equilibrium at p < 10-6. You can do this with vcftools or other softwares but I am most familiar with PLINK. And if you are using PLINK, please use version 1.90 (https://www.cog-genomics.org/plink2) and above as it is much faster than previous versions. You may also find pre-computed allele frequencies per population but my purpose here is how to download and run some calculations on the VCF files. Recently, I have been taken up very much by the modular analysis developed by Damien Chaussabel and colleagues (see original paper or their recent review paper) for analysis of whole blood data. A recent R package called tmod from Dr. January Weiner provides a very easy and elegant implementation of this concept and data. The vignette is well written and the author is very responsive to requests and suggestions. Currently, the evidence plot is based on the receiver operating curve. The next release will contain an option to produce an evidence plot that is the equivalent to enrichment score plot of the popular GSEA software from the Broad Institute. I tweaked this function a bit to allow for different weighting of the genes in the module and to allow it to return the indices of the leading edge subset (i.e. core enrichment genes) which can be useful to generate heatmaps etc. tmod’s evidencePlot has the advantage of not requiring the logFC as an additional parameter. I set alpha=1 as default to match Broad Institute’s default value. Setting alpha=0 will produce exactly the same graph as evidencePlot from tmod. Setting the alpha=2 will overweight the genes in the module and sometimes useful for finding smaller set of core genes. But for all of you busy people, the main result is summarized in Figure 1 (also attached below). The binding efficiency of longer probes are less affected by polymorphism (as expected) but still > 30% of cis-eQTLs are false! 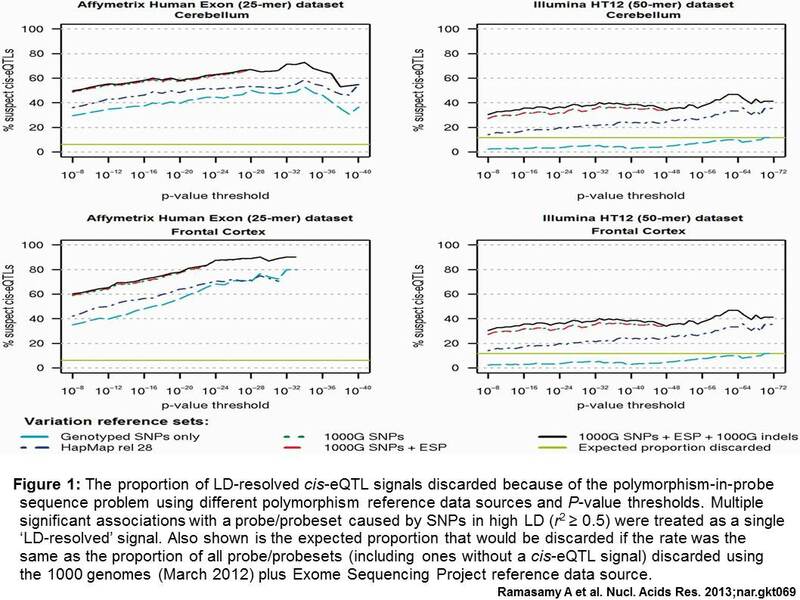 The 1000G dataset appears to be good enough to identify probes containing polymorphisms. The only way to possibly improve on this is to look at private mutations from exome-seq etc but may not be worth the effort. Andrey has many useful examples/tutorials on his MatrixEQTL page. Here I am going to demonstrate how to use MatrixEQTL using data from the UK Brain Expression Consortium (UKBEC). I have chosen the MAPT gene which is important for various neurodegenerative disorders. The data was downloaded from the BRAINEAC website (link to come) and can be downloaded from here. This consortium collected DNA and RNA from ten brain regions in 134 neuropathologically normal individuals. Additionally, the mean expression profile for each individual across tissues (aveALL) was calculated. Let us first load the R data and inspect the format. You may need to change working directory using the setwd() command first or supply the full path. This particular dataset contains information for the 26 expression profiles: one representing the gene-level profile and prefixed with “t” plus 25 representing the exon-level profiles. It also contains the information for 5,287 markers (SNPs and indels) located within 1Mb of transcription start and end sites. "aveALL" "CRBL" "FCTX" "HIPP" "MEDU" "OCTX" "PUTM" "SNIG" "TCTX" "THAL" "WHMT"
Before we proceed, first of all note that some tissue is missing for some individuals as the RNA was not available or low quality. Using temporal cortex (TCTX) as example, we see that 15 individuals are missing for this tissue. Note that MatrixEQTL imputes the missing values before doing the calculations. This is not idea as our values are not missing at random. So we will need to manually exclude these individuals when we convert these datasets into MatrixEQTL format. Let us now extract and format the results a bit. There are 9,412 significant cis-eQTLs (at p < 1e-5) identified within 0.07 seconds and here are the top 6. Now let us try it the traditional approach. Wow, that took over 8 minutes to complete vs. 0.07 seconds for MatrixEQTL. Sure, I can optimize the code above using apply() etc but it still isn’t as fast as MatrixEQTL. More importantly, the results the same. [1,] "chr17:44061025" "3723751" "0.375908482121651"  "0.0652417514030518" "6.86533571244123e-08"
[2,] "chr17:44067382" "3723751" "0.269975506772536"  "0.0504674529615548" "4.43940323821489e-07"
[3,] "chr17:44060492" "3723751" "0.593187349664759"  "0.111183272810956"  "4.72950945585888e-07"
[4,] "chr17:44762589" "3723707" "-0.178887231952771" "0.0343128918690251" "8.08585850844625e-07"
[5,] "chr17:44066464" "3723751" "0.272025753138588"  "0.0530410575681518" "1.16984903179711e-06"
[6,] "chr17:44059497" "3723751" "0.270348263447638"  "0.052784452164607"  "1.20507597159997e-06"
Recently, a friend asked for the difference between a SNP and genotype. After some babbling on my part, here is a summary. Typically we only call a mutation if is seen above a certain frequency (typically > 0.1%) across the population. Otherwise, these are known as private mutations. Confused? Here is a simple analogy. A metabolic disease called diabetes exists but not everyone has diabetes. A medical diagnosis is required to determine the diabetic status of an individual. Nucleotides in positions 1 – 3 are identical across all individuals and therefore not considered a SNP in this sample. The nucleotide in position 4 is a SNP. The genotype for individual 001 at position 4 is C/T. More generally, in the human genome, there are approximately 40 million SNPs which represent about 1.25% of the genome. In other words, the genomes of two unrelated individuals are identical at around 99% of the nucleotides.